COURSE: Fast and flat 4K (2.49 mile) course on paved roads around Levis Commons. Awards to be presented to the overall male and female and prizes will be given to random finishers. All Youngling (12 and under) finishers in the Wookie 1K will receive a finisher’s gift. 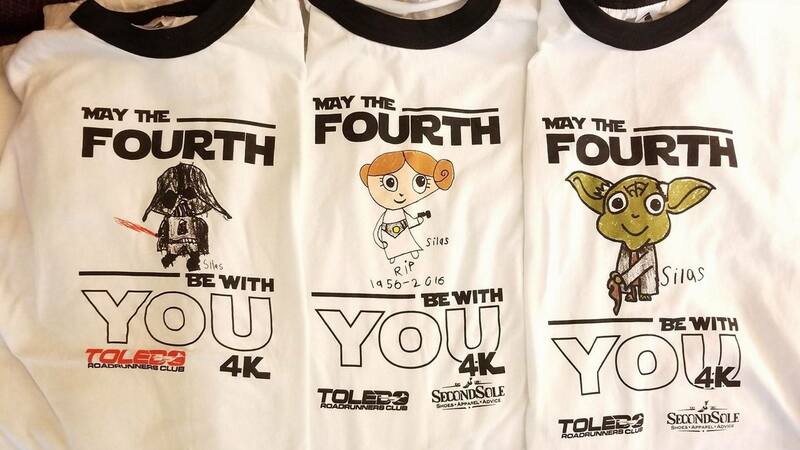 A special May the Fourth be with you 4K shirt is available ONLY BY PRE-ORDER. Orders must be postmarked by 04/19/19. 4K Race – FREE to all TRRC members (NO SHIRT) – $4 for non-members (NO SHIRT) Want a shirt? Add $8. Wookie 1K – FREE to all TRRC members (NO SHIRT) – $1 for non-members (NO SHIRT) Want a shirt? Add $8. You don’t have to mail the entry fee, you can if you want to. Just show up and pay. UNLESS YOU WANT A SHIRT! Please make Race Entry Fees payable to TRRC. Mail to Master Jedi Tom Silva, 527 Darby Lane, Maumee, OH 43537.